You may remember patchouli from the hippie craze of the 60s and 70s but this remarkable fragrance has been esteemed for centuries. The deep, earthy, woody scent is treasured because it lingers an extraordinarily long time. Spicy, sensuous, alluring, sometimes considered an aphrodisiac by aromatherapists, patchouli is the powerhouse of our very popular Patchouli Hemp Seed Oil Soap. We pack as much patchouli essential oil as we can into our signature all-vegetable soap base. Hemp seed oil is one of nature’s best moisturizers and doubles with the patchouli to relieve dry, cracked skin. Combined with the exfoliating properties of oatmeal, this bar is the epitome of what soap should be. As an added bonus, it's a repellent to insects. 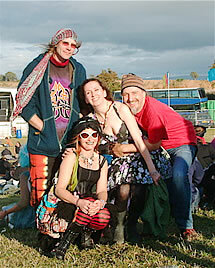 Marcia Crookes, a patchouli enthusiast, sent this happy photo of herself, her husband and friends at a recent concert near her home in England.